If you recall, a couple of weeks or so ago, I had been considering a pair of brown leather sandals I had found while browsing online. Well, I had decided to look locally at Target and Payless for something more affordable and really had no luck. 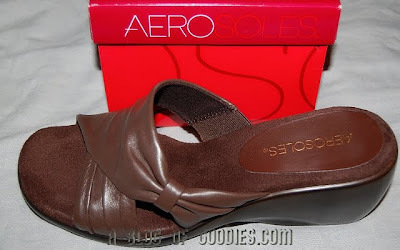 Then I came across these Aerosoles On Deck Leather Sandals when I returned to my online search. I immediately knew that I wanted them! These sandals have a soft leather upper that is gathered to have somewhat of a bow effect without actually having a big bow on the shoe. The rubber soles offer a low wedge heel that is only about 2-1/2" high. I have yet to commit to the flat-sole shoe trend and feel much more myself when I have at least a low heel on my shoes. These are just about the most comfortable sandals I have ever owned. I wore them to the mall, which we ended up walking all the way through twice, and did not have any problems with my feet feeling tired or uncomfortable. With a supple leather upper that holds my foot securely, a sueded cushioned insole, and a cushy rubber sole, how can these sandals be anything but comfortable? This shoes retails for $49.99, but can be found for less depending on what color you choose. It is also available at some retailers in a fabric upper as well. This article was based on my own personal experience with this product, which was purchased with our own funds. No compensation was received for sharing my experience with our readers.